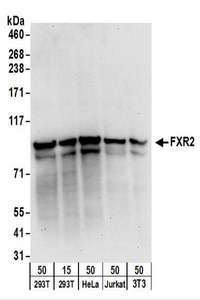 FXR2 antibody LS-C290541 is an unconjugated rabbit polyclonal antibody to FXR2 from human and mouse. Validated for IP and WB. Region between residue 637 and 673 of human Fragile X Mental Retardation, Autosomal Homolog 2 using the numbering given in entry NP_004851.2 (GeneID 9513). 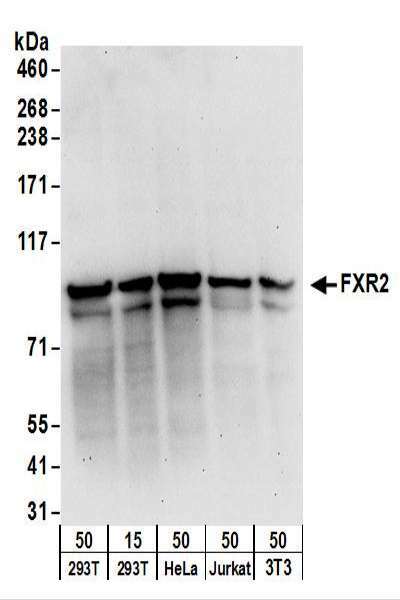 Detection of Human and Mouse FXR2 by Western Blot. Samples: Whole cell lysate from 293T (15 and 50 ug), HeLa (50 ug), Jurkat (50 ug), and mouse NIH3T3 (50 ug) cells. Antibodies: Affinity purified rabbit anti-FXR2 antibody used for WB at 0.1 ug/ml. Detection: Chemiluminescence with an exposure time of 30 seconds.